I’m determined to write positive stuff today. Today is the day I pick myself up out of the tongue-tied misery that is depression and get on with my life. I’ve only been down for a week or two, but that’s enough this time. That includes our best china, cutlery and glassware. Plus my Nan’s serving dishes. She’d have loved that we’re still getting use for them. Plus, if you look really closely, you can see the steam rising off the food. Mmmmm, it’s making me hungry! Of course, there was far too much for two people, but we thoroughly enjoyed ourselves and had all the leftovers for lunch and dinner the next day so nothing was wasted. Next, happy knitting news! I’ve finished…finally…the shawl of doom. It needs blocking, so no photos just yet, but all knitting is done. I’m trying to think of a place to block it now, maybe on our bed, if I pin it out early in the morning and leave it ’til bedtime. We’ll see. I’ve also almost finished the baby picture for Amy. That’s another project I’ll be glad to get done, I have not enjoyed it at all. Of course, with all of these finishes and near-finishes, I’ve ended up with not much on the needles. And I don’t seem to have much inspiration for what to do next. I could start thinking about baby stuff for my brother’s little sprout. Or for my cousin’s. Or something for my other cousin’s wedding, although I don’t even know if they’re planning it to be soon. There is my friend’s birthday in March. Meh! Uninspired! Maybe I’ll just knit socks until something hits me. This entry was posted on January 2, 2010 at 11:29 am and is filed under Cross-Stitch, Food, knitting, Wildlife. You can follow any responses to this entry through the RSS 2.0 feed. You can leave a response, or trackback from your own site. That dinner looks awesome! 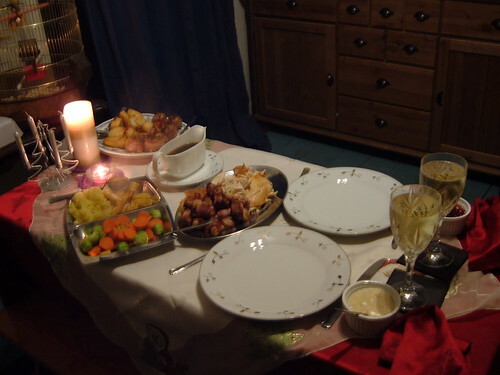 We had a lazy roast dinner on Christmas day, mainly involving pre-prepared vegetables that we just had to stuff in the oven as I decided I’d much rather spend time with the family, and cook an elaborate dinner another day. So similar sentiments to you then really! I hope that you can keep up the positive thoughts. I’ve been struggling a bit recently with bouts of bad temper which I know are a sign that I’m getting a tiny bit depressed again, but so far I’m managing to keep myself more up than down. Being very self indulgent in allowing myself to do all the knitting I want is definitely helping! Happy New Year – I hope it’s a really good one.